Collins Aerospace is not straying from its plan to focus on supporting wireless connectivity and BYOD entertainment for airline passengers instead of embedded solutions, the company has confirmed to Runway Girl Network. 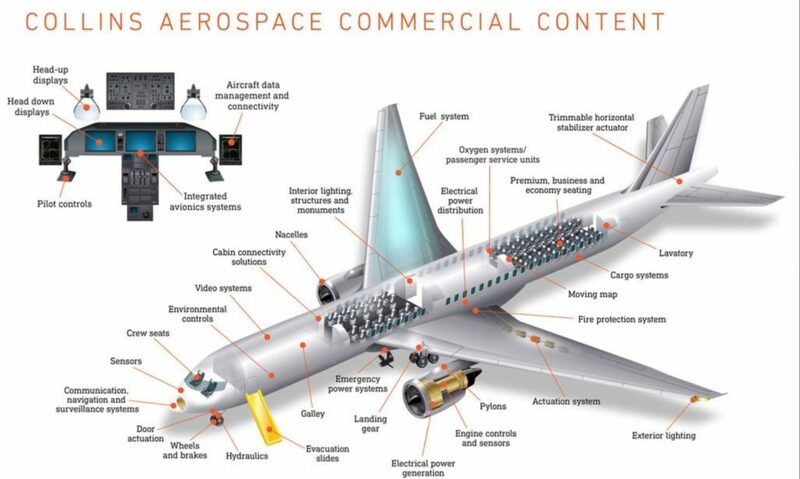 The aerospace behemoth’s position on the subject might seem obvious, given that Collins Aerospace – when it was known as Rockwell Collins – previously vowed it would not invest in in-seat video capabilities, and more recently exited the sector with the sale of its commercial inflight entertainment business to digEcor, which has rebranded as Burrana. Nonetheless, some industry observers wondered whether Collins would seek to fill the (some might say glaring) gap in its portfolio through a tie-up or M&A activity involving much larger players in embedded IFE. After all, Collins’ remarkable nose-to-tail content in the commercial sector is presently missing both in-seat IFE and a cabin management system, though the firm continues to offer its Airshow moving map software to airlines. Following UTC’s acquisition of Rockwell Collins in November 2018, RGN reached out to newly named Collins Aerospace to understand if there has been a shift in thinking since last fall’s APEX EXPO, when Alexis Hickox, who works as head of strategic growth & business development in the firm’s Strategic Programs Division, said the company is seeing less and less need for in-seat IFE. Removal of embedded IFE may provide more space and promote different storage options for the lower seat pitch environment. This would be a huge weight/cost savings for airlines. His comments are in line with conversations we’ve had with certain aircraft interiors designers, who have quietly suggested that the need to provide in-seat IFE stymies aircraft seat innovation. In short, the interiors side of the industry hasn’t always taken a rosy view of IFE, even as many passengers welcome the distraction provided by in-seat systems, perhaps especially when seated in cramped conditions down back. But given the fact that UTC rival Safran boasts ownership of IFE unit Zodiac Inflight Innovations – which is working to carve out business on the 777X and 787 – and the fact that virtually all commercial widebodies are still delivered with embedded IFE, inquiring minds wondered if Collins as part of UTC would have a change of heart. According to management, it has not. As Collins reiterates it is not interested in rounding out its portfolio with seatback IFE, a new entrant in the form of Delta Air Lines start-up Delta Flight Products is on the march. Springboarding off of the work accomplished for Delta’s Airbus A220 wireless seatback system, Delta Flight Products has taken full ownership of delivering wireless seatback IFE to the US major’s brand new Airbus A330-900neo and A321neo fleets, and when retrofitting the system to its Boeing 767-400s. Would anyone be surprised if this particular solution, which features Hitachi tablet displays, finds its way onto Delta partner airline fleets? After all, some of those airlines followed Delta’s lead in adopting Gogo 2Ku inflight connectivity. For its part, digEcor reported last week that its acquisition of Collins’ commercial IFE business has closed, and that it has rebranded as Burrana. It said the move marks the beginning of “an exciting new chapter” for the firm. Specifically, the acquisition brings into the Burrana fold the former Rockwell Collins’ PAVES family of seatback and overhead narrowbody solutions, as well as on-demand TES and eTES systems, which can still be found on aged widebodies. “The workforces from both organizations have been merged together to form Burrana and we are in growth mode. We have an amazing engineering capability focused on continuing our journey of innovation. Our global presence remains as is with facilities in the US, UK, France, Mexico, Australia and China,” Burrana CEO David Withers told RGN via email this week. As noted when RGN first broke the news of the acquisition, the arrangement has catapulted digEcor-now-Burrana into an interesting strategic position in the IFE market, giving it linefit offerability with airframers for the first time. Indeed, Burrana is now laying claim to being the third largest embedded IFE provider in the market. The company has not publicly declared its exact market share, with Withers noting “that would be proprietary” though #PaxEx data crunchers no doubt have more details at the ready. Is there an opportunity to further grow the dropdown side of the business? “As long as customers are ordering narrowbody planes, and the figures from both Boeing and Airbus indicate their orders are on the rise, as this is a popular category of plane, then there is indeed a good deal of opportunity for overhead IFE systems,” stated Withers. Could a new sort of alliance emerge to benefit passengers? The post Collins Aerospace stays the course with wireless vision for IFEC appeared first on Runway Girl.